(adjective) Granivorous describes a diet that consists primarily, though not always exclusively, of seeds and grain. This is the primary diet for many types of birds, especially game birds, sparrows, and finches. Many of the most common backyard birds are granivores that easily come to bird feeders offering different types of birdseed. A granivorous bird may prefer just one type of seed or grain for its primary diet, but they often will nibble on whatever foods are most easily available. The variety of seeds a specific bird eats typically depends on the bird's bill, and smaller birds with smaller, sharper bills will choose primarily smaller seeds such as millet, Nyjer, and native flower seeds. Larger birds with stronger, more powerful bills are more likely to opt for larger seeds such as sunflower seeds and safflower seeds. Some seed-eating birds have very specialized bills, such as crossbills with their thin, tapering bills that allow them to pry seeds out of pine cones and small flowers. Granivorous birds can also eat other things. Many species will consume insects, caterpillars, or spiders as a source of protein for growing chicks during the nesting season, for example. These birds may also change their diets throughout the year as different types of seeds or other foods are more abundant and easy to find in different seasons. Granivorous birds can be a problem in agricultural areas where flocks may destroy grain crops. At the same time, depending on the exact seeds a bird may prefer, some species, such as the lesser goldfinch, are welcome because of the great quantities of weed seeds they consume. While these birds eat almost exclusively seeds and grain, many other types of birds will also nibble on seeds, especially from backyard feeders. Woodpeckers, wild turkeys, ducks, and geese will all be at least partially granivorous when needed. Granivorous birds are some of the easiest types of birds to accommodate at bird feeders, and there are easy steps any birder can take to attract seed- and grain-eating birds. 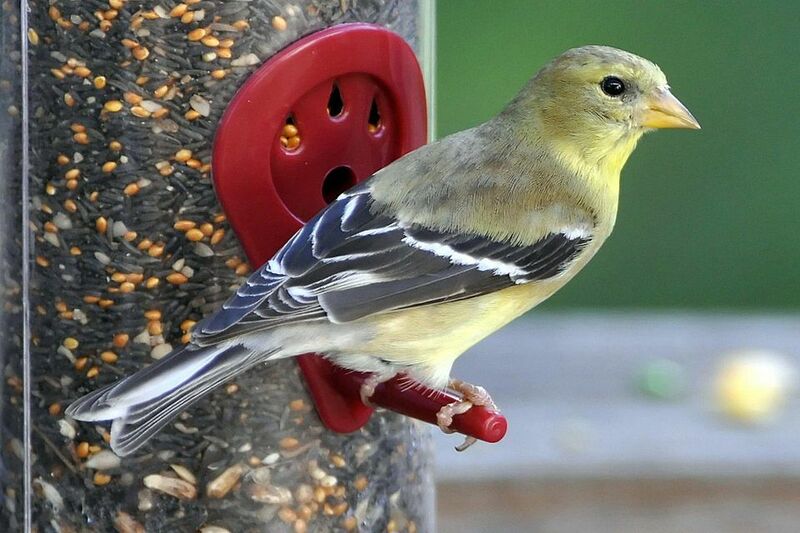 Offer different types of birdseed to attract birds with different seed preferences. Offering both large and small seeds, shelled and in-shell, will attract a greater variety of bird species. High quality birdseed mixes often include a variety of seed types and sizes. Use appropriate feeders, including both tube feeders and open trays that can accommodate large numbers of feeding birds. Some birds will prefer to perch while others prefer to cling, and if feeders can suit both types of birds, more species will visit the yard. Allow ground-feeding granivorous birds such as pigeons, doves, and quail to clean up spilled seed underneath feeding areas. This will be sure no seed is wasted and will attract even more bird species. Do not allow seed to accumulate to dirty, unsafe levels, however. Keep feeders clean and in good repair at all times. Old, moldy seed is less attractive to birds and can foster mildew and diseases that could decimate a backyard flock. Similarly, accumulated feces can harbor bacteria that is harmful to feeding birds. For a natural food source, plant seed-bearing flowers for birds and allow the seed heads to remain on the flowers for birds to feast on during autumn and winter. This can include growing sunflowers in the garden or as part of bird-friendly landscaping. Do not pull weeds or otherwise eliminate natural, native seeds in the yard, including dandelions and other plants often perceived as undesirable. Avoid using herbicides that would take away those familiar food sources from local birds. What Is a Bird Irruption?